Though frustrating with its baffling weather patterns and changing moods, March is a beloved month. It's frequently been a month of change for me. Perhaps it has to do with the time change or the patches of green becoming more visible by the day that create a shift. Either way, March is a month of hope and renewal. While winter is still lingering about and a surprise snow storm could be just around the corner, I'm in the mindset of wanting to be outside. I'm anxious to get my hands dirty and prepare the vegetable garden, plant carrots and tomatoes and as many others as I can squeeze in the beds. After a long, dark winter, I'm ready for more sun, lighter clothing and lighter food. Don't get me wrong, I'm all about the soups and stews and do make them all year long, but spring and summer beckon for lighter food and lots and lots of vegetables. 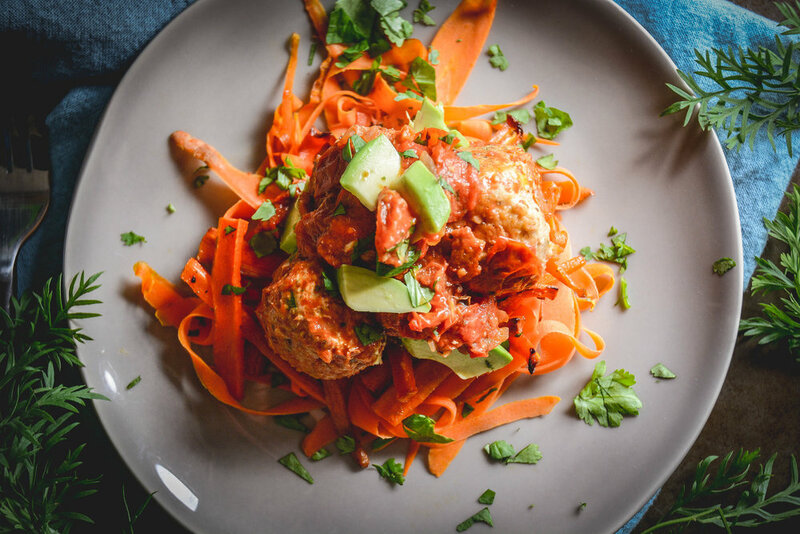 A dish I made quite a bit last summer is this chicken meatballs with tomatoes and carrots. Since my tomatoes ripened quicker than I could pick them, we had a surplus that needed to be used. And what better way to use tomatoes than in a fresh sauce with plenty of olive oil, fresh garlic and oregano, right?? I opted for chicken meatballs instead of beef as they simply work better with this tomato sauce. My recommendation is to work the chicken meatballs gently since they're a bit more delicate than their beef cousins. While chicken itself can be quite bland, cumin, coriander and ginger infuse these chicken meatballs with loads of flavor. A favorite in my house that doesn't disappoint. Combine all ingredients for chicken meatballs, form 1" balls and set aside. Preheat large, heavy pan on medium heat. Add avocado or olive oil and chicken meatballs and cook on each side for about 3-4 minutes until brown. Set aside. In the same frying pan used for chicken meatballs, add 1 tbsp olive, garlic and shallot and sauté on medium heat stirring continuously for 2-3 minutes. Add tomatoes and oregano and cook for 2 minutes. Add broth and deglaze pan, scraping any brown bits off the bottom. Lower heat, add salt, pepper and optional, maple syrup and simmer for 5 minutes. Return meatballs to pan and cook an additional 10 minutes stirring occasionally. Lastly, preheat medium pan, add add olive oil and carrots and sauté for 5 minutes, until soft. To plate, add carrot spirals, top with meatballs and sauce and sprinkle with additional cilantro. If you wish, add a few bits of avocado, which adds a layer of creaminess.